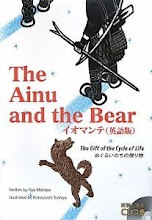 The other day, a copy of a picture book titled The Ainu and the Bear arrived from Peter Howlett, an English instructor at the Hakodate La Salle High School in Hokkaido. 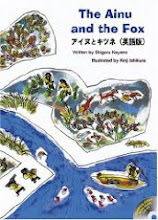 It was, in fact, the English translation of the book that my own group (Tokachi Basho & Kankyo Laboratory) planned and produced as Iomante~ meguru inochi no okurimono, written by Ryo Michico, illustrated by Kobayashi Toshiya, and published in 2005 by Parol-sha. Iomante refers to the Bear-sending ceremony of the Ainu people, which starts with a bear hunt in the winter. The hunt itself involves locating the den of a hibernating bear. If there happens to be a new-born bear cub in the den, only the mother bear is killed, and the cub is taken back to the kotan (village) alive. The meat and fur and every part of the mother bear goes to meeting the needs of village life. The bear is a gift from heaven, and every last part of it is greatly valued. The bear cub is treated the same as a human child. It nurses at the human host-mother's breast until it is weaned, and it lives inside a house with its human host-family. As it grows bigger, the cub is transferred to a cage built of logs, but it continues to receive the very best food the village can provide. This continues for 1~2 years, until the day is set for the ritual that sends the bear cub's spirit back to heaven. Once again, no part of the bear is wasted. The meat and the fur are precious gifts that the bear has left behind in appreciation for the hospitality he has received from the village, and it is accepted with gratitude. We Japanese, an agrarian people, considered this practice filthy, and detested it. 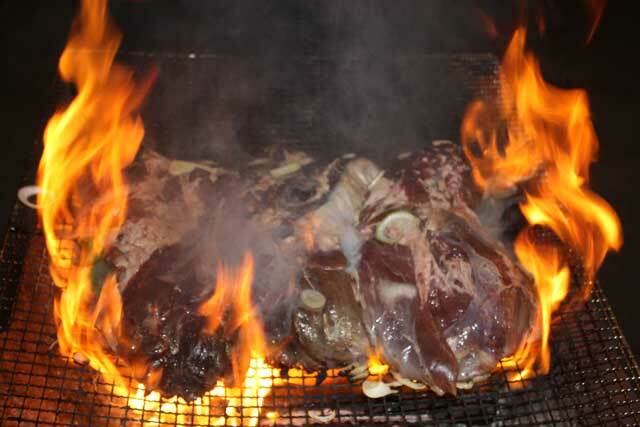 In the old days, it was not our custom to eat the flesh of four-legged animals. 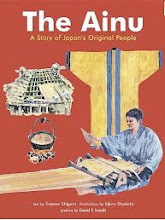 With the dawn of the Meiji Era, our people did indeed begin to eat animal flesh, but not as the hunter peoples do. To this day, we eat meat without witnessing the killing of the animals that provide it. Can this be right? The activity of eating, whether the food source is plant or animal, is ultimately the act of eating life-- of taking life. Surely this is the true significance of the greeting "itadakimasu (I will receive this)," which we say before each meal. When we get into the habit of seeing only voiceless plants and chunks of meat that bear no resemblance to the animal from which it came, our awareness of receiving life is dulled. I am not saying that we should be forced to watch animals being processed at the meat processing plants. I myself once went to a chicken factory and became unable to eat chicken meat for a while after. But even without observing the killing, it should be possible to teach ourselves that we are receiving the life of another every time we eat. This is precisely what we had in mind when we conceived of the Iomante picture book project. It so happens that two years after our book was published, the Hokkaido government rescinded the ban they had previously placed against the Iomante ceremony for being too "barbaric." It was the Project Uepeker team, represented by Peter Howlett, that had come to me with a plan to publish an English translation of our book. It is our hope that the English version of this picture book will remind people all over the world of the gratitude we owe to the precious lives that are given up to keep us alive. Every once in a while I come across an interesting blog post about one or more of Hokkaido's Ainu museums. I have been to them all and have mentioned them from time to time on this blog, but I enjoy the fresh perspective and sometimes startling insights that first-time visitors have on the subject. 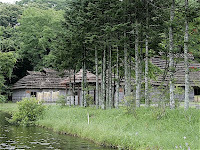 Take, for example, P.D.Healey's post on the Shiraoi Ainu Museum & Village (also called Poroto Kotan). 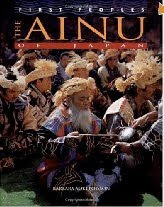 At the end of an informative and upbeat post briefly explaining who the Ainu are and what the museum offers, Mr. Healey makes a comment comparing the feel of place to "some of the faux Native American tourist traps I remember visiting on trips out west as a kid in the 1960s." This is an understandable comparison, especially when you have to walk through "a gauntlet of shops selling Ainu related souvenir items" to get into and out of the museum village itself. 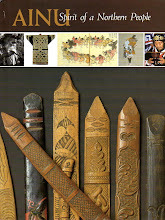 It helps to be prepared for this, as Shiraoi Ainu Museum is definitely worth the trip. More recently I found Justin Hunter's blog which has a series of posts about different Ainu museums, including one of my favorites, the Sapporo Ainu Cultural Center (also called Pirka Kotan). This museum is at the southern edge of Sapporo city limits, making it a good choice for visitors who are short on time. But the best thing about it is that it is so very hands-on. "The idea behind their museum is to get a true hands-on experience to see how these things feel, sound, smell, etc. Its awesome!!!" Mr. Hunter enthuses in his post, and I absolutely agree. Another post on the Hunter blog that I appreciated was the one about Asahikawa. Asahikawa is Hokkaido's second largest city, and it has a fine city museum with lots of Ainu exhibits. Mr. Hunter has many nice things to say about the exhibits, but found it lacking in comparison to Sapporo's Pirka Kotan and Shiraoi's Poroto Kotan, which he had blogged about earlier. Although "the artifacts themselves were wonderful," he says, "the Asahikawa exhibits felt very distant and the layout seemed quite unnatural." I was amused to read his description of another little museum, grandly calling itself the Ainu Memorial Building, which is so small and hard to see from the road that he almost missed it. "A complete hole in the wall," he calls it, though he gives it credit for having some rare artifacts. I am familiar with this little museum. It is owned and managed by the son of the late Kawamura Kaneto, the well-loved and respected Ainu chief elder of Chikabumi village (now part of Asahikawa city). Chikabumi is close to where I lived as a child, and I spent a great deal of time there because Kaneto and my father were involved in a joint project. I returned for a visit a few years ago, and saw the museum for the first time. It was exactly as Mr. Hunter describes. Sapporo, Shiraoi, and Asahikawa are not the only places in Hokkaido with Ainu museums and/or memorials to Ainu life and lore. Others can be found in Nibutani, Kushiro, and Noboribetsu. As I come across insightful or amusing traveler's descriptions of these places, I will bring them to your attention. Your input is also welcome.